Biemme's B-fluo range is very bright yellow, but it's a good fit and effective despite being knitted polyamide rather than the more usual roubaix fabric. 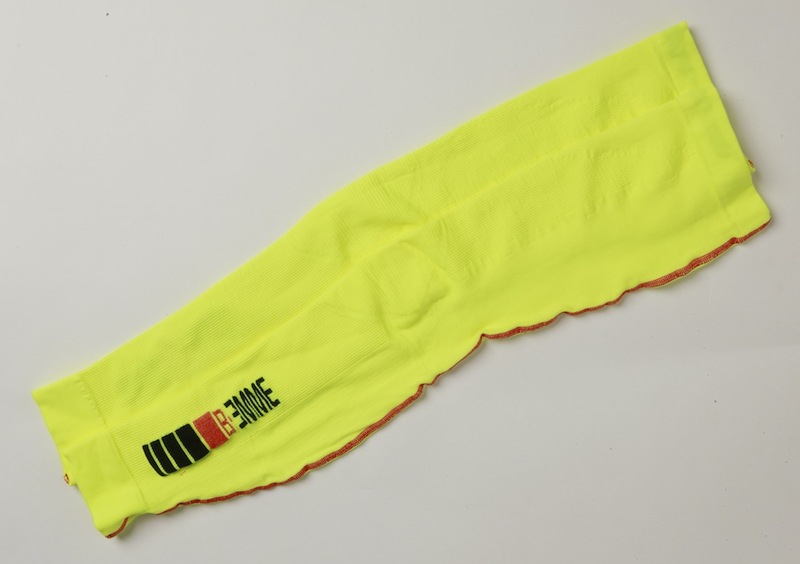 Biemme’s B-fluo legwarmers are a shockingly bright yellow, so there’s no excuse for anyone not to see you coming. They’re made from a stretchy knitted polyamide with 5% elastane, which Biemme claims is hypoallergenic and antibacterial. The weave is structured, so that there’s a slight curve and a more stretchy area over the knee for improved articulation as you pedal and there is a single flatlocked seam up the back of the warmers. This makes them comfortable to wear and they’re easy to get on and off, even when wearing cycling shoes. I did not find the seam intrusive in use and there’s no rubbing, as the warmers are so stretchy. The stretch also means that they stay put once on and can be pulled a long way up the thigh for plenty of overlap with shorts and a double layer of insulation over the thigh muscles, which are working hardest when riding and need to be kept warm for efficiency. The legwarmers pair up with the matching armwarmers. Like the legwarmers, these are made of stretchy knitted polyamide and elastane. In the case of the armwarmers, there’s a more stretchy knit over the elbow, which is effective to prevent rucking on the inside of the joint. They are quite a close fit which ensures that they stay up and they taper with your arms so that they fit closely at the cuff without discomfort too. Despite the weave being quite open, I found both the arm and leg warmers comfortable and windchill resistant at temperatures around 10C. The armwarmers can be pulled down and worn comfortably around the wrists if the weather warms up a bit and there’s not too much bulk either. Both the arm and leg warmers are also quick drying, pocketable and easy to wash – but just a bit bright for retiring types.